It’s not quite a chest bump, but it’ll do. 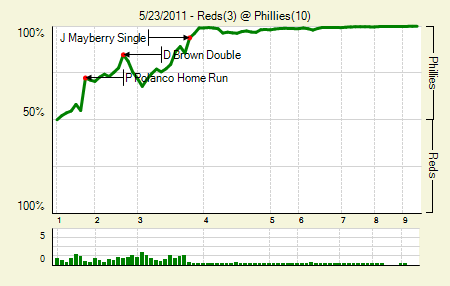 Moving the Needle: Michael Bourn doubles home the tying runs and sets up the victory, +.469 WPA. In a way, it was compensation for an error that cost his team a run. 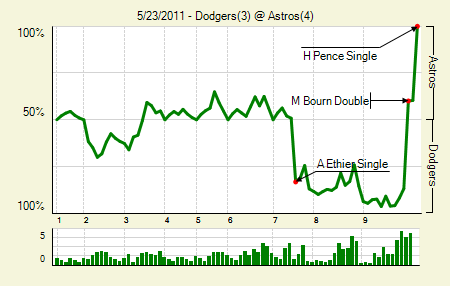 In the seventh, the Dodgers had runners on first and second with two out when Andre Ethier grounded one up the middle. 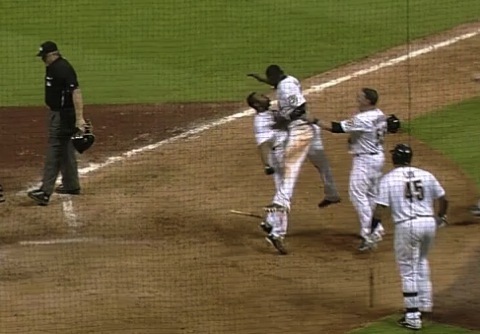 Bourn charged, probably in an attempt to nab the slow Dioner Navarro trying to score from second. But he missed the ball. By the time he recovered the Dodgers had scored two. When he came up in the ninth he was in the same situation, first and second with two outs, but Bill Hall did him a solid by starting a double steal. Bourn then doubled down the right field line to tie the game, which put him in position to score when Hunter Pence singled. Bill Hall: 2 for 4, 2 2B. His Astros tenure hasn’t gone well so far, but he played a huge part in this win. Clayton Kershaw: 6 IP, 4 H, 1 R, 2 BB, 7 K. He was at only 84 pitches, but he was lifted in the top of the seventh for Ethier. 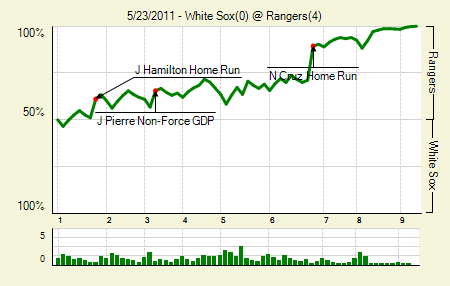 Moving the Needle: Torii Hunter doubles home the go-ahead run in the eighth, +.243 WPA. After the two starters battled to a stalemate through seven, this one was left in the hands of the bullpen. While it appeared as though the A’s might break through against Scott Down in the eighth, they were left with a runner stranded in scoring position. The next inning they were undone. With Bobby Abreu standing on second after a stolen base, Hunter doubled into the right-center field gap to bring him home. Jeff Mathis — yes, Jeff Mathis — came through later in the inning with a two-run single that sealed it for the Angels. Jered Weaver: 7 IP, 6 H, 1 R, 3 BB, 5 K. He worked out of a bases loaded, one out jam in the third with only one run allowed. He also got some help when Hunter nailed a runner coming home in the seventh. Josh Outman: 7 IP, 5 H, 1 R, 3 BB, 2 K. Not bad for his first start of the season — first since 2009 — though you’d like to see a better K/BB. This was only the second time in his career that he has completed seven innings. 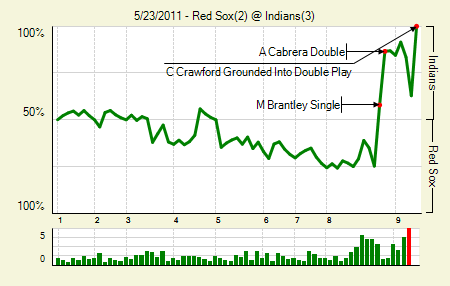 Moving the Needle: Carl Crawford ends the game with a double play, -.371 WPA. In a way, the Red Sox were only in a position to tie the game because of Crawford; his fifth inning homer put them up 2-1. The Indians took the lead in the bottom of the eighth, when Michael Brantley singled home the tying run (+.326 WPA, the highest positive swing) and Asdrubal Cabrera then doubled home Brantley. In the ninth the Red Sox got a pair of singles to put runners on the corners with one out for Crawford. He got a head 2-1, but then hit one right to Orlando Cabrera, who started a quick, clean 4-6-3 double play to end it. Justin Masterson: 7.2 IP, 5 H, 2 R, 2 BB, 3 K, 1 HR, 11 GB. In three career starts against his former team he has gone 21.2 IP, 11 H, 3 R, 8 BB, 12 K, 37 GB. Clay Buchholz: 7.1 IP, 4 H, 2 R, 2 BB, 4 K, 1 HR, 15 GB. So they have nearly identical lines, which is kind of amusing, because I’m sure Cleveland tried like hell to get Buchholz instead of Masterson in the Victor Martinez trade. 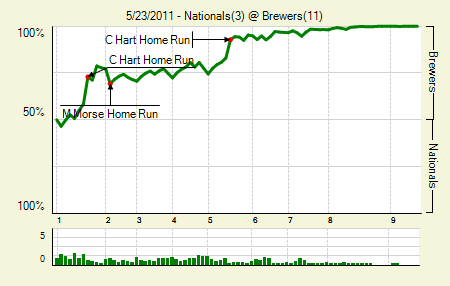 Moving the Needle: Corey Hart strikes his first homer of the evening, +.145 WPA. Thanks to Hart, the Braves didn’t have to worry much about this one. In the first Hart took an outside pitch way deep to center, bringing home a pair and staking the Brewers to an early lead. Prince Fielder followed him up with a homer to make it 3-0. He added another two-run shot in the fifth to make it 5-1, and then in the eighth he had one more go round, bringing home three this time to make it 10-1. Yovani Gallardo: 7 IP, 5 H, 1 R, 1 BB, 9 K, 1 HR. Now he’s starting to get something going. His last four starts: 27 IP, 16 H, 5 R, 7 BB, 29 K.
Ryan Braun: 2 for 5, 2 2B. Poor Braun. Both of his doubles followed Hart homers, so he had no one to drive in. 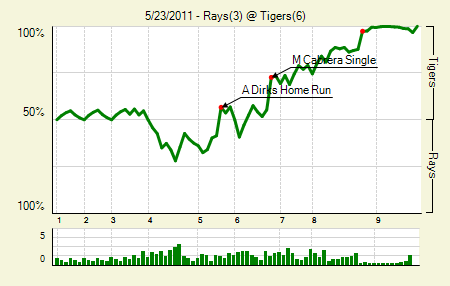 Moving the Needle: Miguel Cabrera singles home the go-ahead run in the sixth, +.174 WPA. Jeremy Hellickson looked good at the beginning of this one, and, really, he handled himself well throughout. But in the sixth he ran into some trouble when Brennan Boesch doubled with two out. Miguel Cabrera followed that up with an RBI single to put the Tigers ahead 2-1. They then struck it big in the eighth, when Victor Martinez struck a bases loaded double to plate another pair. Jhonny Peralta singled home two more, putting the game out of reach — even for a wild Jose Valverde. Andy Dirks: 1 for 3, 1 HR, 1 BB. That’s his first big league knock and his first big league intentional walk. Moving the Needle: Chase Utley returns to the lineup, +1.000 WPA. OK, so he had no hits in his first game of the 2011 season, but the Phillies’ offense had scored just 15 runs in its previous 9 games, so let’s just pretend that Utley is the spark plug that ignited them. In terms of the game as played on the field, Placido Polanco’s first-inning, two-run homer added 17.4% to the Phillies win expectancy. As the final score indicates, they kept tacking on, driving Bronson Arroyo from the game in the third. Raul Ibanez: 2 for 4, 1 HR. Remember that whole hitless streak he had going on at the end of April? Since he snapped it he’s hitting .353/.380/.618 in 71 PA.
Carlos Ruiz: 3 for 3, 1 2B, 1 BB. I know a lot of people who attributed Ruiz’s stellar 2010 to his spot in the order, eighth. He’s hit eighth just four times this year, which provides some correlation (though I’m not buying a causal link, to be clear). 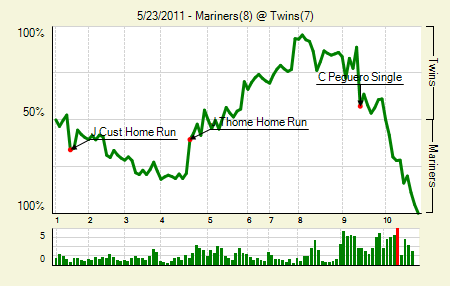 Moving the Needle: Carlos Peguero comes through again in the ninth with a game-tying single, +.316 WPA. Peguero’s hijinks started last week, when he hit an innocent pop-up that Torii Hunter lost in the sun, which led to a walk-off win for the Mariners. This time Peguero came through in the top of the ninth, with two outs and his team down one. That put the game into extras, and the Mariners won on a sac fly after loading the bases. Jim Thome: 2 for 3, 2 HR, 2 BB. It’s pretty impressive when you miss all of May and then come back to hit two homers in your return. Jack Cust: 2 for 5, 1 HR, 1 BB. Yes, that is his first home run of the season. It feels odd to type that when Cust has been the DH in Seattle all season. Moving the Needle: Daniel Descalso breaks the tie in the ninth, +.312 WPA. The starters did the heavy lifting in this one, leaving the bullpens to duke it out. 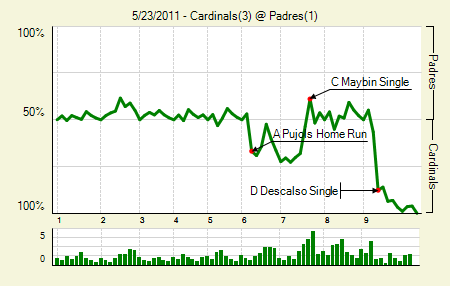 Heath Bell was the unlucky victim, allowing a double and then Descalso’s single. Another single brought him home, giving the Cards the W.
Dustin Moseley: 7 IP, 5 H, 1 R, 3 BB, 3 K, 15 GB. 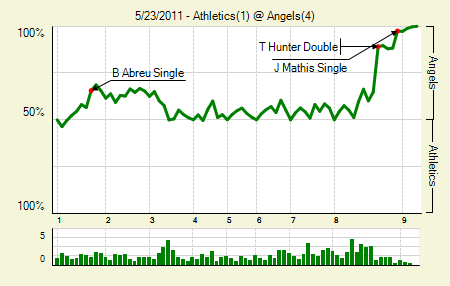 The lone run: an Albert Pujols homer. Albert Pujols: 1 for 4, 1 HR. That was his first homer since, get this, April 23rd. Yes, a month between homers for Albert. What is this world coming to? Kyle Lohse: 8 IP, 5 H, 1 R, 1 BB, 5 K, 11 GB. I don’t think even Lohse’s family expected him to pitch this well this year. 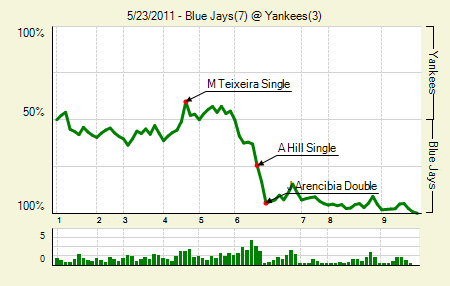 Moving the Needle: J.P. Arencibia blows the game open with a three-run double, +.115 WPA. Through the fifth Bartolo Colon had allowed just one run, but he fell apart in the sixth. A double, intentional walk, sacrifice, and intentional walk loaded the bases with one out. Aaron Hill shot a hard grounder to left, which only allowed one run to score. Eric Thames then walked on four pitches, and Arencibia struck it rich with his double to deep center. That was enough for a Jays victory. Jose Bautista: 1 for 3, 1 HR, 2 BB. One of the walks was intentional, in a pretty obvious intentional walk situation. His homer came in the first. Moving the Needle: Nelson Cruz announces his return with a two-run shot, +.183 WPA. The Rangers got both Cruz and Josh Hamilton back from the DL yesterday, and both hit homers. Hamilton’s came in the first, a shot that just cleared the wall in right. Cruz pulled one into the stands in left-center in the sixth, putting the Rangers up 3-0. Alexi Ogando: 9 IP, 5 H, 0 R, 3 BB, 6 K. Someone in the Rangers’ organization is getting a raise for helping make this decision. Michael Young: 3 for 4, 1 3B. He hit cleanup, instead of Cruz or even Adrian Beltre. This was his justification. We hoped you liked reading The Morning After: Game Recaps for May 23rd by Joe Pawlikowski! Is it Time to Panic in Cincinnati? The Rays pitched to Miguel Cabrera with 1st base open? When does that happen? Probably the last time we’ll see that for a while. Kyle Lohse is the reason why StL has been able to handle Wainwright’s injury. They were depending on Carpenter, Wainwright, and Garcia to carry the staff. I’m actually surprised there hasn’t been an article on him. I don;t see many other as compelling pitching stories than what Lohse is doing. Through just 10 starts in 2011, Lohse has surpassed his combined WAR of 2009 and 2010. I’m not a Lohse fan, at all, but he has replaced Wainwright’s expected production. Not likely to continue, but 10 starts of 2.06 ERA is already in the bank. …and we thought Charlie Morton has having a turnaround season. Get a Brain! Morans. Heh Heh. Lohse has done a good job of matching Wainwright’s production, but it was actually Kyle McClellan who was inserted into the starting rotation because of Waino’s injury. McClellan has pitched solid as well (for his first season as a SP). It has all worked out beautifully so far. Carpenter remained the ace and is putting up a ~3 WAR (pace) season. Garcia moved up to #2 and is putting up a ~6 WAR season (pace). Lohse moved up to #3 and is putting up a ~5.5 WAR season. Westbrook remained the #4 and is putting up a 1.5 WAR season. And McClellan steps in as the #5 and is putting up a 1 WAR season. While Garcia was not expected to put up a 6 WAR year, he was expected to be 3+. Lohse was not expected to be anywhere near where he is, and is finally earning his money. Just like 2010, StL has “the big 3” on the mound, only Lohse has replaced Wainwright in the trio. McClellan is really replacing Suppan.